The Sharks lost both games on Sunday in Sölvesborg. “Sometimes you win, sometimes you lose and sometimes it rains”, Edgren says. The Sharks were feisty and full of confident when they took the field against the Sölvesborg Firehawks at Deer Creek Park. And they played well. Leading pretty much all of the first game behind a strong outing from José Martinez, they went into the bottom of the 7th leading. A laser line drive with two outs changed all of that as the Firehawks walked it off 8-7. Göteborg Hajarna will probably want to forget game two as fast as possible. Despite a solid start from ‘Swirvin’ Shervin Shakki, this one was lost from the get-go. Against the Firehawks squad, filled with Elitserien players, there is not much room for error. 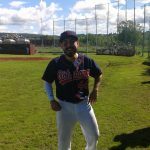 Sölvesborg took an early lead and never looked back as they mercy ruled the Sharks 10-0 in five innings. “They are a strong team. 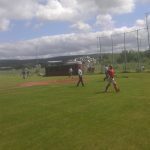 Pretty much an Elitserien team and we were on the brink of winning the first one,” Coach Edgren says. “Winning is better than losing, but this was a step forward,” he concluded as he walked away from the beat writers and Shark faithful who travelled to see the game. Update to follow when boxscores are available. This entry was posted in Gothenburg Sharks on July 30, 2017 by alex. The doubleheader in Sölvesborg on July 29 promises to be the toughest yet for the Sharks, with the Firehawks filling out their short-handed regional squad with top elite players. Sölvesborg’s regional team has an impressive record of 8-1, but it’s no secret around the league that much of their success is due to the infusion of players from their strong elite team, currently undefeated at 8-0. With Sölvesborg B regularly starting five to six elite players in regional games, this is not your typical regional team. Then again, with Jose Munoz, Jose Martinez and Mokhlad Al-Ghanimi in the Gothenburg lineup, and backed by a host of other solid players, this year’s Sharks are not your typical regional team either. Although inconsistent at times, how well the Sharks do in Sölvesborg could give fans an indication of just how far this team can go. And it goes without saying, that winning is always better than losing. “Playing an elite team in Sölvesborg will snap us out of holiday mode and into playoff mode,” says Coach Edgren, obviously looking forward to the challenge. 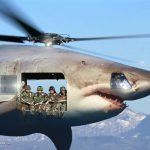 This entry was posted in Gothenburg Sharks on July 10, 2017 by Joel Earnest. As one winning streak ended, another began. Sunday was an offensive outburst for the Sharks. “We had pretty good discipline today,” coach Edgren says. The surprisingly large turnout at Shark Park did not have much fun as game one got underway. Behind starter Mikael Lindquist (0-1), Göteborg Hajarna (7-3) were guilty of sloppy and unfocused defense. And as the Sharks faithful always preach, you can’t do that against Tranås (3-3). The away team got to an early 5-0 lead in the 1st and added three more runs in the 3rd until the Sharks smelled blood and got back to life. Behind surprise relief pitcher number one of the day, Jonny Edgren, the Sharks added one run in the bottom half of the 3rd, three in the 4th and three in the 5th to make this a game again. 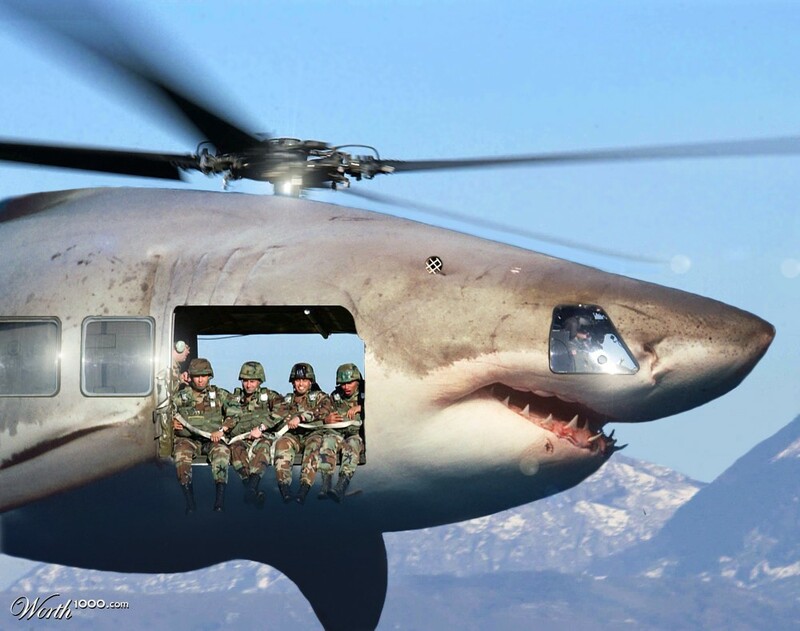 Alas, this one was not for the Sharks. A very questionable balk and an umpire missing a tag at third cost the Sharks one run in the 6th and one in the 7th. The Tranås side added another one to go into the bottom half of the 7th leading 11-8. With two outs, the Sharks got going again and added two runs. With the tying run 90 feet away, Jun Kono, who was fighting a bad stomach, unfortunately flew out to center to end the game at 11-10 to Tranås, ending the Sharks four game winning streak. “This is what happens when you give up those extra nineties, it cost us this game,” coach Edgren says. al-Ghanimi was, as always, happy anyway. With a depleted pitching staff, it was most welcome news when ace Mokhlad al-Ghanimi (3-1) unexpectedly showed up to play. Even with al-Ghanimi on the mound, the runs kept coming for Tranås anyway. 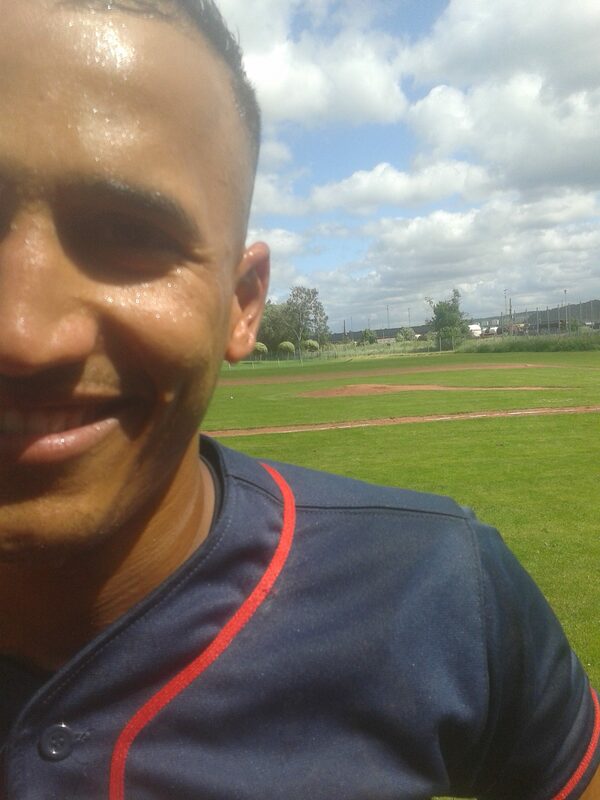 The former Iraqi national team player was somewhat erratic on the mound, hitting six Tranås players and walking five. He did, however, also go on to strike out seven leaving the Sharks defense with little to deal with. Behind the plate, veteran catcher Toofan Khazal was brilliant as he saved al-Ghanimi from having more than the four wild pitches that he amounted to. Khazal desperately tried to hit with his catching gear on but to no avail. After giving up one run in the 1st and two in the second, the Sharks fought back and tied the game in the bottom of the second. With that, al-Ghanimi settled down a little and looked more like his old self. In relief came the second surprise relief pitcher of the day; none other than Kris Bryant’s best bud – Rickard Kronqvist. Making his regional series debut, Kronqvist was excellent and got some help from a solid defense. Kronqvist ended up getting the save, pitching three scoreless innings and giving up just two hits and a walk. “Kris is most likely proud of me right now. He thinks winning is better than losing, so there’s that,” Kronqvist says. At the plate, the Sharks added three more runs in the fifth and loaded the bases on multiple occasions without getting the clutch hit. However, the Sharks looked very good at the plate. Seldom wasting at bats and every player got on base one way or another. Promising for things to come. Order was restored as Niclas Ekström was once again hit by a pitch in the first game. Joel Earnest made history in all kinds of ways. In the first game, he had his first career infield hit and then topping it with his first career double. José Muñoz made a dazzling play when diving for a ball to get the out at second and combining with al-Ghanimi and Johan Weidolf to complete a slick double play in the 7th inning of the second game. A play that most likely would make the highlight reel in any MLB game. 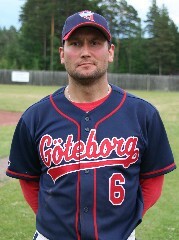 Göteborg Hajarna has not scored ten runs and lost since 2012. This entry was posted in Gothenburg Sharks on July 2, 2017 by alex. The same team might not be the same team. “Other guys will have the chance to shine,” Coach Edgren says. Swedish baseball, on occasion (or always), can be called bush league. During the hectic summer weeks, teams get depleted on the basis of vacations and such. 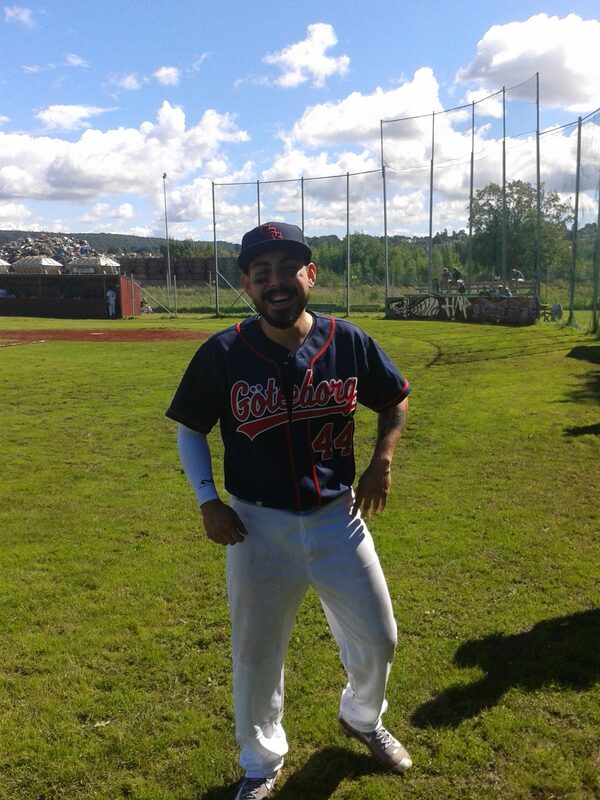 Göteborg Hajarna (6-2) is no exception as they are short a whole pitching rotation coming into Sunday’s game versus Tranås (2-2). With Mokhlad al-Ghanimi (3-3), Shervin Shakki (2-1) and José Martinez (2-0) all out of action, the Sharks will have to look for new arms to step up against the division rival Tranås. “I feel ready, I feel confident, put me in coach and all that good s**t,” Eric Marquez says. When arriving in Sweden, Marquz realized that winning is better than losing. Marquez is an option that the Sharks coaching staff is mulling over. As is coach Edgren himself who’s had success over two centuries. Other than that, veteran reliever Joel Earnest is available as well as Toofan Khazal and Rickard Kronqvist. “We have multiple options, I just want to help the team and I’m ready to do so if skip needs me,” Marquez says. On the offensive side of the ball the Sharks are looking to comeback kid José Muñoz to spearhead his team. Muñoz would have been gunning for the league lead in most offensive categories if it would not have been for the ridiculous and stupid rules of Heatstat. 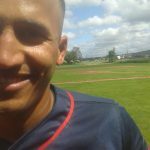 Nonetheless, Muñoz is sporting a cool .615/.769/.1475 slashline going into Sunday’s game. The Sharks have had a short summer holiday as they’ve not played in the regional series for three weeks when they swept the Pilots in Malmö. 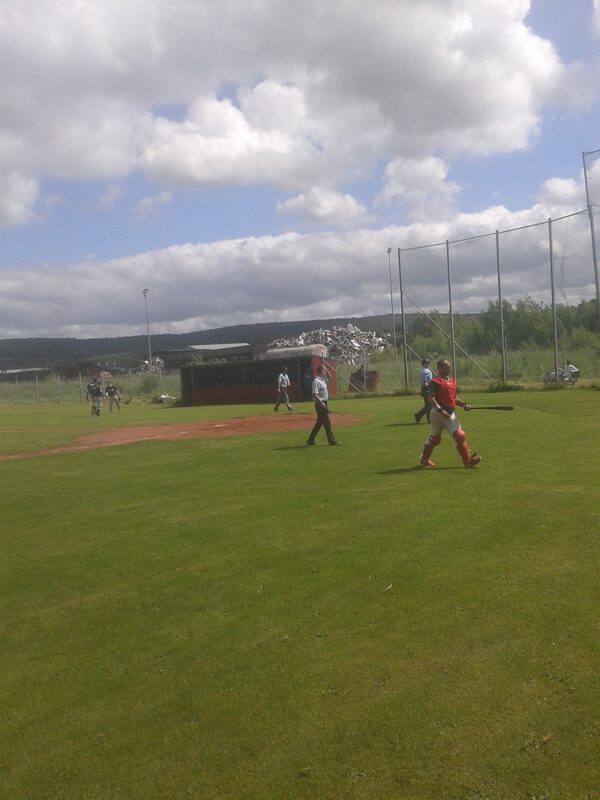 Coach Edgren did, however, had a squad in Skövde a week ago for some SWBL action. Tranås, on the other hand, has not had a regular season games since May 21st when they swept the Sharks at home. First pitch is at 12.00 @ Shark Park. Make sure to be there early before the bleachers are full. This entry was posted in Gothenburg Sharks on July 1, 2017 by alex. Joel Earnest became the oldest Elitserien player in 2015 when he pinch ran for Trolle Brandt (50 years his junior). In that same game, he took the mound in relief and was subsequently relieved by his son Erik Earnest.